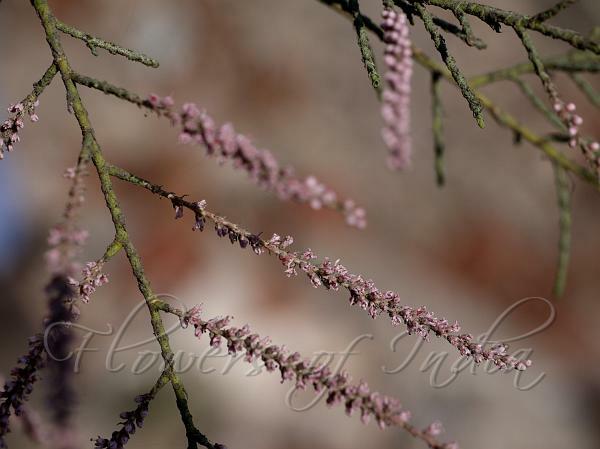 Indian Tamarisk is a tall hairless shrub or small sized tree, 2-6 m tall with reddish-brown bark. Leaves are tiny, stalkless, ovate with triangular base, stem-clasping or eared, pointed, 1-2 mm long, without coherent margins. Flower recemes are 3-12 cm long, 3-4 mm broad. Rachis is minutely papillose or entirely hairless. Bract triangular, acuminate, somewhat irregualrly toothed at the margin, sometimes slightly keeled, 1 mm long. Flower-stalk is shorter than bract, 0.5 mm long. Sepals are 5, fused at the base inner somewhat broader than the outer, outer more acute, ovate to somewhat circular, deeply toothed at the tip, margin somewhat membranous, 0.75-1 mm long, about 0.5 mm broad. Petals are 5, free, elliptic or elliptic-obovate, blunt, 1-2 mm long, 0.75-1 mm broad. Stamens are 5, filaments threadlike. Capsule is about 6 mm long, conical, triangular. Flowering: January-October.